I’m an avid rice eater and my day is not complete without eating rice at least once a day. Earlier it used to be rice for both meals, but over the years with so much of variety added to our diet, we tend to eat rice for any one major meal of the day. 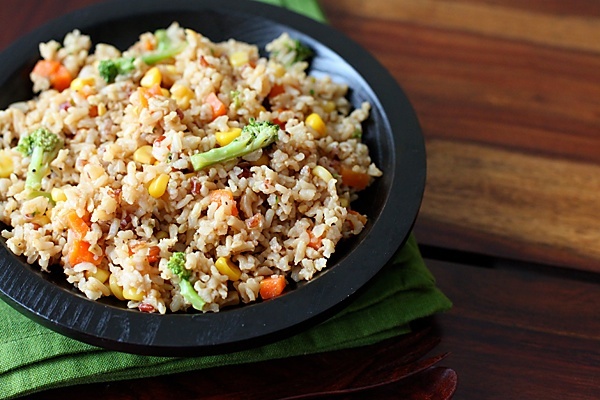 Over the years, we have also begun to relish the taste of brown rice more than before. Of course, I would use only white rice to make biriyani or to eat with rasam or when I’m greatly in need of that plate of comfort meal or even when I want to make a good savoury fried rice. But, slowly and gradually we have come to love brown rice too. Its deep nutty flavour, chewy texture and filling attributes make it an ideal accompaniment for curries and fried rice like the one we are talking about today! And it only helps that the rice is rich in fiber because of all the bran being intact as opposed to polished white rice which has all the bran and the nutrients stripped away from it. 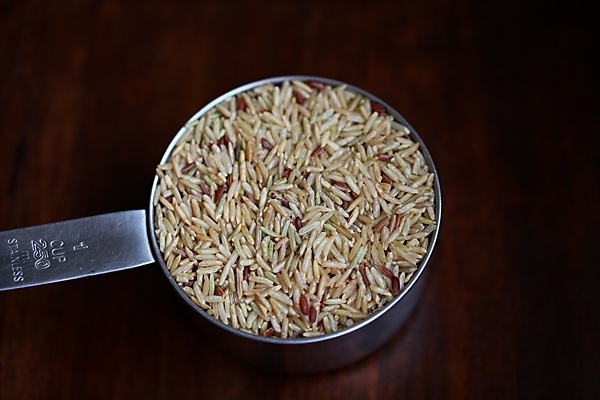 Loaded with nutrients like B vitamins, manganese, selenium and iron, every morsel of this rice is like a health capsule. Besides, brown rice is also known to be good for digestion, for controlling high blood pressure, maintaining the ideal sugar balance in the blood and also good for heart health. 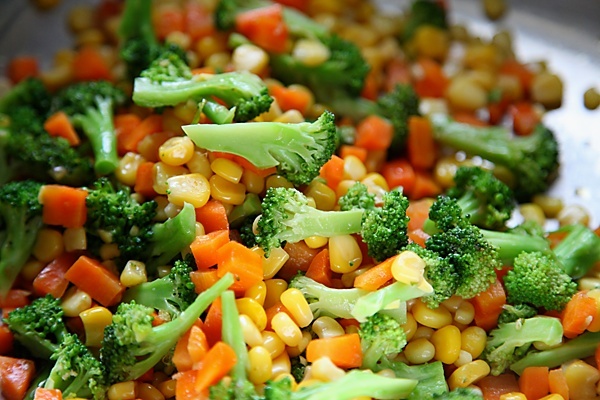 This stir fried vegetable rice made with brown rice and lots of colourful vegetables looks beautiful, tastes great and is easy and quick to put together. It makes a great dish for a party (when made with lots of other additions), a lunch box, a week end meal or one of those days when you want to have a great meal but have little time on hand. 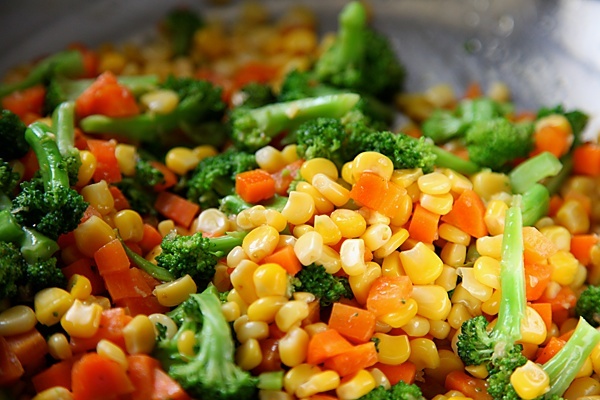 Just chop some vegetables, cook the rice and mix with a few ingredients and you have this great looking meal which scores high health points too! 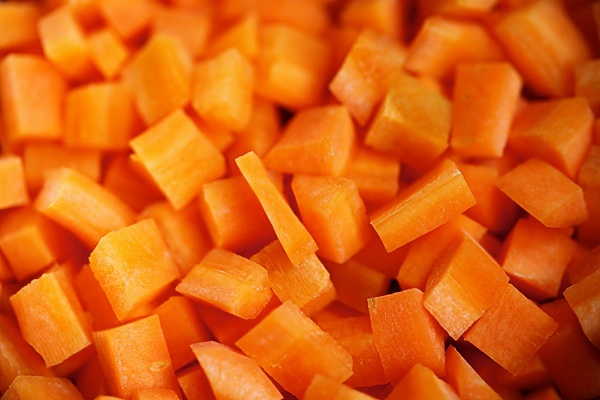 You can look for inspiration in your refrigerator for this dish and can use any fresh seasonal vegetables of your choice. Bell peppers, celery, cabbage, bamboo shoots, mung bean shoots, cooked green peas all work well! Adding tofu or paneer cheese not only makes it delicious but also provides protein making it nutritionally adequate. Wash the rice well and place it in a bowl with enough water to cover it for 30 minutes. discard the water and cook with 750 ml (3 cups) of water in an electric rice cooker, pressure cooker or in a pot with a well fitting lid. The cooking time varies for each method. You can find more information on how to cook rice here. The water varies for different strains of rice and some varieties may require more water. In a wok, heat the oil over a medium flame. Put in the chillies and ginger and stir fry for a minute. Add the vegetables, one after the other and stir fry for 3 to 4 minutes. Lower the flame, cover and cook for a few minutes more until the vegetables are tender, about 4 to 5 minutes. Add the optional tofu or paneer cheese if using, soy sauce, salt and pepper, mix well. Add the cooked rice, stir well and turn off the flame. Wat a filling and satisfying rice,soo tempting n colourful..
A colourful and healthy meal! There is no mention when to add the rice…plz advise. Also which brand of brown rice do u use? Thanks for maintaining such a great space and love your variety too! Keep up your great space! And wish to comment here more often! Sounds great. Going to try soon, have some of the brown rice, just enough for this. I'm in heaven that you made this recipe. It's unusually hard to find a good stir fry recipe and this looks incredible. I love all of the fresh veggies and the addition of paneer. Absolutely delicious. Had been on vacation to India for lovely long 3 months and its been crazy to come back! How have you been an how is hte little one? Harivansh? 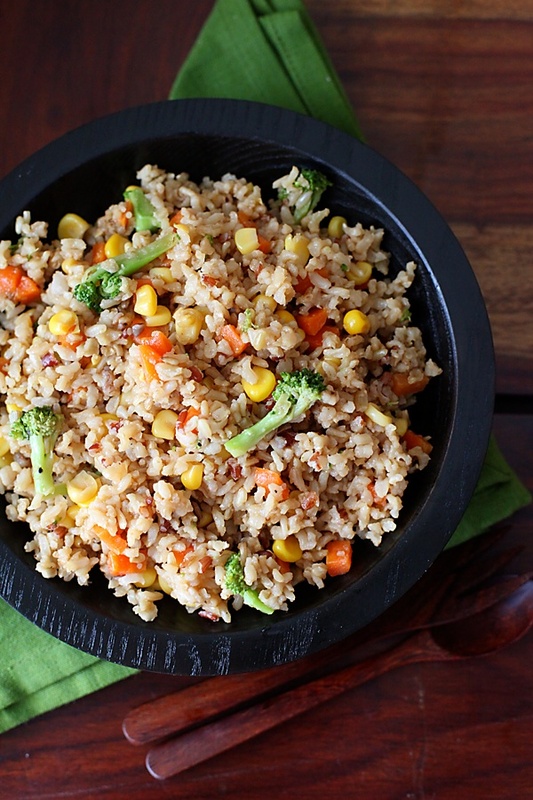 Lovely concoction of tried and tested flavours on brown rice…Its a winner all the way!!! As you know it is very difficult to please toddlers but he really enjoyed it Thanks!!!! Thank you everybody for taking the time to comment! Manya: Thanks for pointing it out! Rectified! Vidya: Love to hear from folks like you! So, please feel free to write in anytime! I use organic brown rice from "Navdanya"! If you pre soak the rice and cook it with the right amount of water for the right time, you will get good brown rice! Would love to hear from you again! El: So glad you liked this! 🙂 You, will love this too, I promise! Shoba: Nice to hear that you had a great vacation! Harivansh is doing well…thank you. And…yes, this is a winner all the way! Shruti: So happy that you are testing my recipes and that your family is enjoying it! It's really nice to hear from you again! Tried this recipe. This tasted great closer to restaurant style (it will be little bit more saucy there, guess I ll try adding little bit more water next time). I sure liked your recipe, but have a query-is soya/soy sauce considered satvik? I thought it wasn't…Thanks. Niki: Soya sauce is a very important ingredient in Oriental cooking and as it is for sattvik cooking we are omitting so many other ingredients. Naturally brewed soya sauce used in moderation is ok provided it doesnt have spices like garlic in it. i want to know whether there is a specific way to cook sesame oil? i'm not sure bcz it gives out a very weird taste and smell. but it doesn;t in restaurant food so maybe i'm doing something wrong. Dilekha- If you use good quality sesame oil which is fresh, there shouldnt be a problem and you can use it like any other regular oil.